Riders joke around coming around a bend during theSOS Outreach Colarado-Eagle River Ride last year. SOS Outreach announced on Thursday, July 5, that the River Ride is on hiatus this year, but will still be hosting the Roadhouse Mountain Bike Race as a fundraiser on July 28. 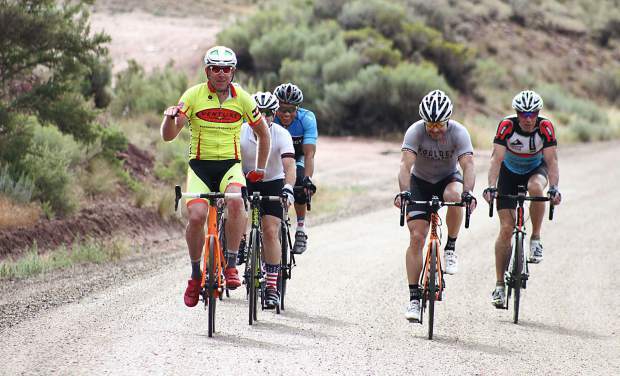 EDWARDS — SOS Outreach announced on Thursday, July 5, that the annual Colorado-Eagle River Ride is on hiatus as the organization’s annual fundraiser and that the third annual Roadhouse Mountain Bike Race on Saturday, July 28, will serve in its stead. However, declining numbers in participation as well as the costs involved in staging a large-scale event, complete with support-and-gear (SAG) stations caused SOS Outreach to rethink the event. Chesney said that participation in the River Ride had dropped from “more than a thousand” during its heyday 5-10 years ago to approximately 500 riders in 2017. Thus, the Roadhouse Mountain Bike Race will take center state on July 28. Both the short and long loops will start and end in the village at Beaver Creek at the base of Centennial. The short route is 6 miles and takes riders up Strawberry Park back over to Beaver Creek and down. The long route is 13.5 miles and heads out to Bachelor Gulch and Arrowhead and back. Mountain bikers can ride as individuals or as a team. Individual entry is $45, while five-person teams are $200 and 10-rider squads are $350. Registration is at http://www.sosoutreach.org. All proceeds go to SOS Outreach. “We’re a youth development nonprofit with locations nationally that provide opportunities for youth with positive adult mentoring and outdoor adventure,” Chesney said.